Getting My Griswold On – Day 14: Home!! My last night on the road did not disappoint. Once the sun set and dusk settled in (10 PM this time of year in this part of the country), I grabbed my camera, hopped in the car, and drove down Vista Avenue in the direction of downtown Boise. I had scoped out Ann Morrison Park, site of the big fireworks extravaganza, earlier but it was closed to vehicles and elbow-to-elbow with people. They were still streaming in as the festivities were beginning. Rather than battle the crowds, I pulled over into a grocery store parking lot and watched the display from there. It was nothing short of spectacular, and I thought to myself, how fitting that the last day of this incredible road trip across America would end with a literal bang. 4th of July fireworks over Boise, ID. It was an emotional moment for me. I had seen so much of this great country of ours over the past two weeks, you might say I fell in love with the U.S.A. all over again. I felt a swelling of patriotic pride as the fireworks rumbled and boomed over Boise and silently congratulated myself for accomplishing my dream of traveling across a great swath of America. It was a grand finale in more than one sense of the word. 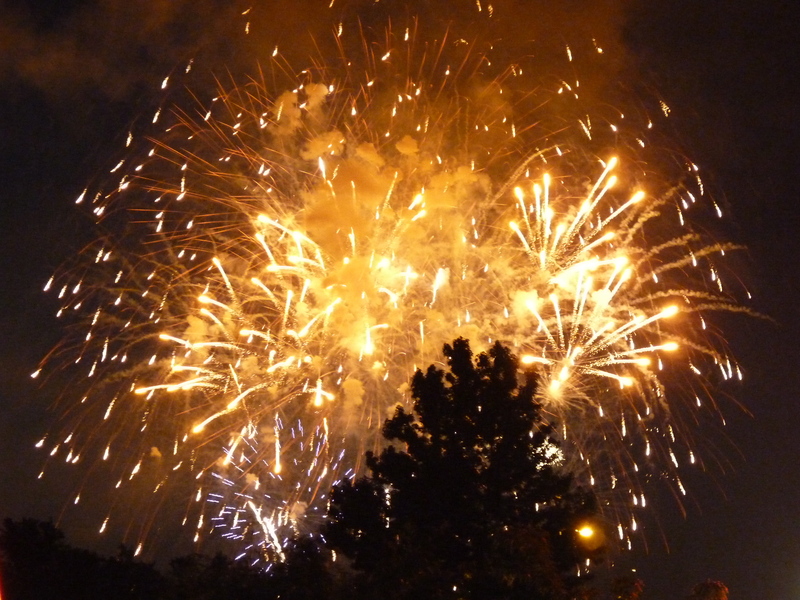 Once the fireworks ended, I left the parking lot and drove the few miles back to my motel. On the way there, my car’s odometer rolled over to 100,000 miles. Wow! I have never owned a car longer than five years before, and the ol’ Hyundai Santa Fe is now nine years old. She’s been the most reliable and dependable car ever, and even though she struggled a bit in Wyoming, she found her mojo again today on the last leg of the trip and will, hopefully, continue to perform well for a while. As a reward for carrying me more than 5000 miles, I’m giving her a few days off this week. She has earned it. When I got back to my room, I was excited because I knew after unwinding it was time for bed, and when I woke up, I would begin the final portion of my trip. I was more than ready to come home by then! My alarm was set for 6:00, but I woke up a little before that and got up. Took my last motel shower for awhile, packed up my stuff, checked out, and hit the road. While my drive through Idaho the day before was surprising because I’d been expecting trees but found desert, my drive through Oregon today was equally surprising because I’d been expecting desert but found trees. Ha…so much for my knowledge of geography! Seriously, everybody knows that Oregon (and Washington) are like two separate states: there is the wet side west of the Cascades (home! ), and the dry side east of the Cascades. But I had never actually been to eastern Oregon before, and did not realize I’d cross two mountain ranges – the Wallowa and the Blue – before settling into the arid, flat portion. 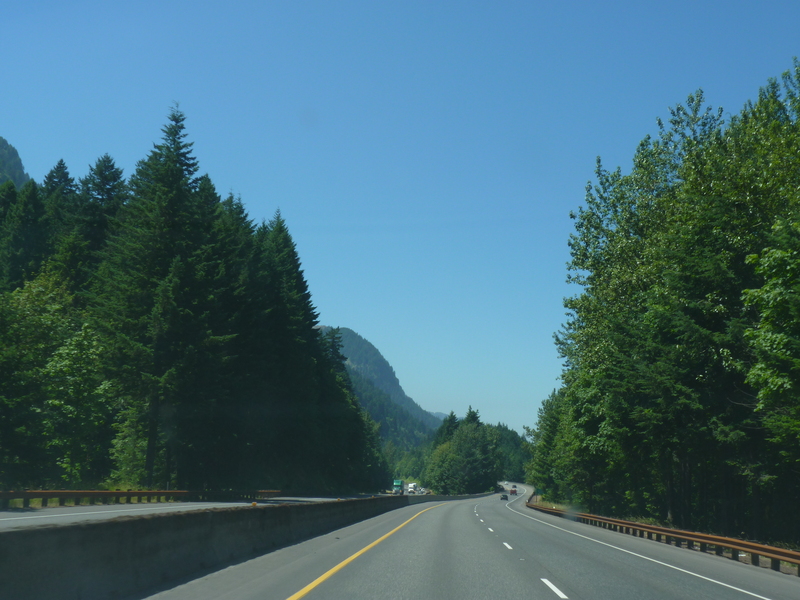 My drive was beautiful, all snow-capped peaks and forested hillsides and streams. I stopped at a rest area outside Baker City, and the air was actually chilly! I’ve been so used to opening my car door and being greeted by a blast of hot air, this was both a shock and a welcome relief. Alas, the landscape did change for the worse, but then it changed for the better again as I drove through the Dalles and entered the Columbia River Gorge. I was thrilled to see familiar sights again, and marveled anew over the lush, green beauty of this place I call home. And while I loved the thunderstorms I encountered on my trip, and miss the fireflies, and wish it would snow more than it does, I can say with certainty after my travels that I am living in the greatest place in the country. For me, at least. The Portland metropolitan area is, and always will be, my true home. I spent a lot of time reflecting on my trip during the last few days of driving. Was it everything I’d hoped it would be when I first set out during what feels like a lifetime ago? The answer is an unequivocal yes. I had a fantastic time! Every day was an adventure, and the journey truly was just as much fun as the destination. The trip opened my eyes to different parts of the country, and allowed me to experience how others live across this great land of ours. The great plains and the midwest are so incredibly different than the Pacific northwest, and yet, charming and unique in their own way. I’d been feeling pretty insulated here in my little corner of America, and now I feel like the world is a much bigger place, wide open and full of possibility. I saw that firsthand. It was almost like I got to experience a different culture – one in which Sinclair gasoline stations and White Castle hamburger joints and row after row of cornfields dot the landscape; where the weather is often dramatic and intense; and the people – no matter how different their lives may be – are, at heart, really the same as me. I realized, as well, the truth behind the saying “life goes on.” 25 years after leaving Rapid City, and 31 years after bidding farewell to Dayton, both places had changed some…but they also stayed remarkably the same. I found my childhood home, wearing new colors and sheltering a different family, but still standing, exactly where I had left it decades ago. Same goes for my elementary school and my high school. Growing up an Air Force brat is a transitory existence; everything seems fleeting and temporary. Retracing my footsteps was comforting in an odd sort of way I can’t really describe. It showed me there is permanence in the world, after all. My memories are more than just memories: they’re part of a bigger, ongoing reality. It was a fantastic experience to see these places again. Best of all, I no longer feel like my life is boring or empty. I’ve seen a lot, and yet, I’ve barely scratched the surface. There’s a lot to see and do still, and while my wanderlust has been cured for now, I have no doubt there are future adventures just waiting for me to discover them. But for now, I’m going to relax. 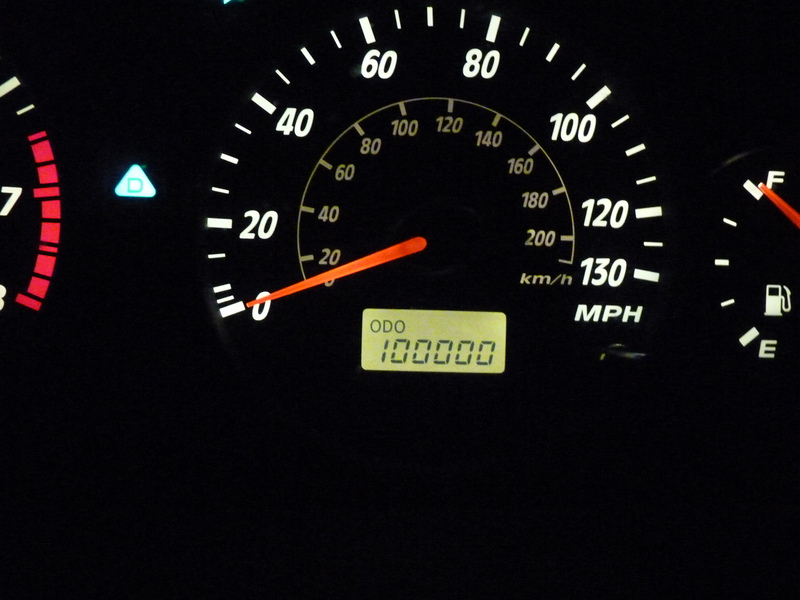 My car's odometer rolled over to 100,000 miles on July 4, 2011. Mount Hood meant I was getting closer to home! The familiar scenery of the Columbia Gorge served as a verdant reminder of why I love this part of the country so much. I LOVE that you captured the moment of your odo turnover…awesome! I’m so impressed with your journey — and jealous, I’ll admit. While I’ve traveled some and seen wonderful destinations, I’ve never really turned the journey into the trip. I’ve driven between Reno and LA numerous times, but never really ventured outside of that corridor. Now that I’m divorced and embracing my 2.0 version and have kids two weeks on/off, perhaps this is my chance. Of course, there’s also a part of me that would love to take them on this kind of journey — but alas, I fear an 8- and 11-year old lack patience for that kind of trip! Mikalee – I could not have done this if I was married. Or if I hadn’t caught a rare break and had two long weeks without the kids (which never happens). My point? You should totally do this now, while you can! I always said “someday” but someday never really happens unless you make it happen. If you do it, I guarantee you’ll have the time of your life and the memories will last forever! Next road trip – Head SOUTH down I-5 and through Arizona, New Mexico & Texas, shoot up through I-35 to Dallas and do another loop (but bring me!!! We’ll go Storm Chasing in some real states that have spectacular dry Thunderstorms (like Arizona!). There were many variations of this trip planned, the original taking me out to Rapid City and then south to Dallas and back home in a loop through New Mexico and Arizona. But then sanity prevailed when I realized how HOT it is down there this time of year. Hell, it was hot everywhere I was, regardless! 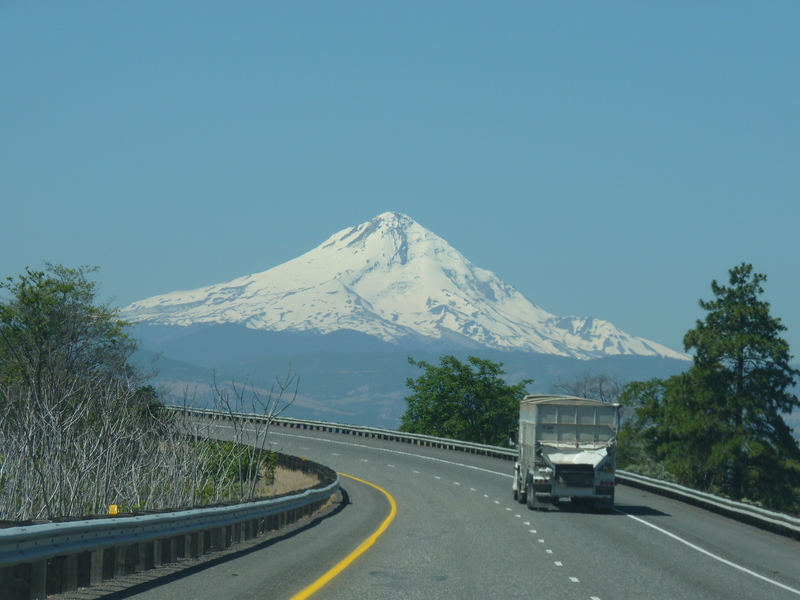 And that picture of Mt Hood is gorgeous – and that's Crown Point, right, on the edge of the Gorge? I’m not sure if that exact peak is Crown Point, but it’s in the vicinity of there, anyway. I am SO looking forward to sleeping in my own bed tonight!! It changed my life, Catherine. It’s made me feel differently about both my past, and my future. It’s hard to sum up in words how, or why, but maybe since you had a similar childhood you can understand that a little. Awesome photos! The one of the fireworks is AMAZING! And also the one of Mount Hood – WOW! Welcome home, buddy! And enjoy your time getting settled back in. Yup…there’s no place like home! Thanks for following along the whole time, Ron! Readers like you made it worthwhile to spend a couple of hours every evening updating my blog and posting to Facebook. Half the fun for me was in knowing that you – and others – were following along! With all the corn I saw, Becky, I refuse to believe anybody will ever go hungry ANYWHERE. And also, if Orville Redenbacher charges more than about a nickel for a bag of popcorn we are getting ripped off. Glad you were following along – I had a blast! Wait, Mark–so, being married means you cannot take a solo road trip??? Wait a sec…there’s such a thing as a marriage “where each one’s needs are being met”? How did I miss out on having one of those?! If you and your hubby have that type of solid, loving relationship, I say go for it! You’ll have the time of your life. Welcome home Mark! I can’t even begin to express my heartfelt thanks for taking me and so many others along with you on your journey. It truly was a remarkable trip and I’m sad that it is over. Welcome home. I’ll miss the adventure stories, though. So, when do you want to discuss the Portland app? Give me a few days to unwind, then we’ll talk. I guess I’ll just have to find more adventures closer to home and write about them! Welcome back home! Kitty must be happy today. Having lived so much of the past couple of years far, far from home, I know how good it feels to finally walk through ones own front door! A journey completed–a life well-lived–and all the sweeter upon return! Thanks for sharing your adventure–it’s been fun! Mark…I never said I was talking about my marriage. Glad you’re home safe again! I must say you’ve outdone me, all my road trips involve E.R. visits and scars, but you managed to survive 4 timezones and 14 states without a scratch! Well done! Must have been the SPAM, heard it works like spinach for Popeye in some people. Thanks for sharing your journey with all of us, it was really cool to hear your thoughts and see all the photos of your cross country trek. Next I expect a post on making the ultimate mix tape. Clearly you’re an expert now.